At 7 p.m. on Wednesday, March 25, In Fine Spirits and Templeton Rye will host a seminar and tasting, featuring Templeton Rye Prohibition Era Whiskey, a small batch rye whiskey made in the tiny town of Templeton, Iowa (population 350). Scott Bush, president of Templeton Rye, and Michael Killmer, brand manager, will lead guests through a virtual distillery tour, and provide tastes of the product itself and cocktails based on Templeton Rye. Chef Marianne Sundquist will also pair food with the Templeton cocktails. The event will last approximately ninety minutes, in a casual format with plenty of time to interact with the Templeton Rye representatives. In Fine Spirits offers its wine and spirits classes, events and special tastings in its second floor event facility. With 1,600 square feet of space accommodating small and large groups, this venue is also ideal to plan private parties and receptions. Space for this event is limited: to RSVP, call In Fine Spirits at (773) 334-9463, or purchase tickets online on our website, http://www.infinespirits.com/. When prohibition outlawed the manufacture and sale of alcoholic beverages in 1920, many enterprising residents of tiny Templeton, Iowa, population 350, came together to create an American classic known as Templeton Rye Whiskey, or "The Good Stuff" to those in the know. Over the course of its storied history, Templeton Rye became Al Capone’s whiskey of choice, quickly finding its way to the center of his bootlegging empire. Speakeasies in Chicago, New York and as far west as San Francisco poured Templeton Rye as the "Best Whiskey in the House". Later legends suggest that a few bottles even found their way inside the walls of Alcatraz to the cell of prisoner AZ-85. Available legally for the first time, the infamous small batch rye whiskey returns. Aged in charred new oak barrels and produced from the original Prohibition Era recipe, Templeton Rye provides a smooth finish and a clean getaway. 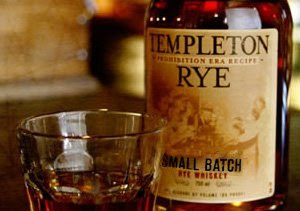 Find out more at http://www.templetonrye.com/. In Fine Spirits offers Chicago’s Andersonville neighborhood a destination to discover affordable, high quality wine and spirits in an educational format. Engaging classes, special tasting events and a friendly and knowledgeable staff in the retail store and bar can guide you in your exploration. For more information, visit our website: http://www.infinespirits.com/.